Montsant is a demarcated wine zone of north-east Spain that curves around the better-known Priorato, in the Tarragona region south and west of Barcelona. Montsant wines are most familiar to UK drinkers from the exemplary co-op called Cellers de Capçanes, but the family-owned estate of Joan d’Anguera is 200-year-old, now run by brothers Joan and Josep d’Anguera, who have taken over winemaking from their father Josep. boasts some wonderful old-vines Grenache and Carignan, there is much excitement about the Syrah made here. Josep d’Anguera senior introduced a Syrah clone to these northern Spanish vineyards in 1980, which he obtained from UC Davies in California, after much experimentation with clones from the Rhône and elsewhere. In this baking hot region which I visited in November 2005, the Joan d’Anguera vineyards benefit from plantings at altitude on mostly north-facing slopes. Cabernet Sauvignon is also grown, and the line-up includes a fortified sweet red, much in the style of Banyuls just across the border into southern France, but it is Syrah that seems to excite the brothers most, and their top-of-the-line cuvée called ‘El Bugader’ will be 100% Syrah from the 2005 vintage on. Bugader is an old Catalan word for a riverbank where clothes were washed, and grapes for this wine come from a selected riverside vineyard. Left: brothers Joan and Josep d’Anguera. Clearly, whatever their father has done here to make Joan d’Anguera one of the most exciting estates in Spain, the brothers will not rest on their laurels. They are tinkering with blends, switching from American oak to French, and selling off much of their grape production to local producers so that they can concentrate on quality. 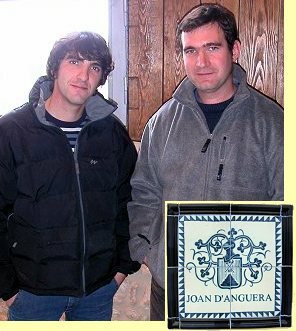 The superb wines of Joan d’Anguera are made in relatively small quantities, but are well-priced, and worth seeking out. 40% Cabernet, 30% Garnacha, 20% Mazuela, 10% Syrah. This has quite a vivid nose, with a slight note of fish oil/mackerel, and a schisty quality, with some dusty black fruit coming though. There is a little toast and caramel in the background. The palate it has lovely fruit; a juicy quality with blackcurrant and a touch of juicy, ripe black plum. Some liquorice in the tannins, with a fine bittersweet note, and fine charry quality in the finish but the pure, fresh fruit stays focused. Very good value at under £10 a bottle. 40% Syrah, 35% Cabernet, 15 Garnacha, 10% Carinena aged in a mix of new and old French and American oak for 12 months, but Joesp says they are moving to 100% French from the 2004 vintage. It has lovely smoky, elegant, schist and blackcurrant-marked fruit, with a touch of black olive and thyme. The palate has a smooth, supple black fruit juiciness, with dry savoury damson fruit and a nice tannic structure. There’s a real lip-smacking juiciness to this wine, with plenty of plumskin and cherry acidity and a fine, long, lightly smoky and spicy finish. Superb. Around £12 per bottle. Barrel sample. Very pure blackcurrant and blackberry pastille fruit on the nose. Fine, cedary, and very attractive. A touch of earth and very nice fudge background. Lovely palate too, with terrific fruit sweetness and concentration. Very high acidity and powerful tannins; plenty of bite and a dry, dusty savoury quality. Lots of dry extract. And finishes with lovely fruit and tannin complexity. 6,000 bottles. All barrel-fermented from 2004.